Ok, so the D&D 30 day challenge took a bit of a hiatus. But today it’s back! And today we talk about our favorite gaming dice. This brings up a few things I’d like to talk about, things that are probably personal quirks but that perhaps some people share. I’ll just stream of consciousness this and see what happens. I really don’t like dice that are hard to read. 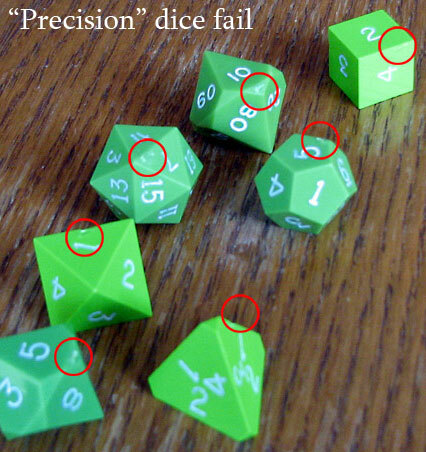 This means clear dice, or dice where the numbers and die don’t have enough contrast, or where the dice material is so busy that it makes reading them frustrating. When I roll a die, I want the result to be obvious, to pop. I like dice, particularly d20s, with more rounded edges. They tend to roll longer and to “wander”. I love a die that wobbles back and forth as it rolls, it increases the drama, particularly if it’s easy to read as you’ll see numbers flip by and hope that it stops on a good one. You also often get a head fake, where one result seems to come up right before flopping over or back to another or previous result. This tends to make the table go wild. Love it. I like certain numerical distributions better than others. 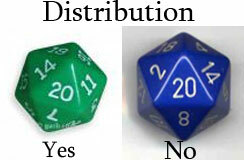 I prefer Koplow’s distribution to the Chessex distribution. I like my 20s to be surrounded by 11, 14, and 7, as opposed to 2, 8, and 14. There are several other distributions but these two are by far the most common. 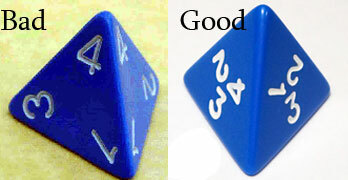 I like my d4s to be read using the lowest number that sits flat on the bottom, rather than the number on the point. So, with all that said. My favorite dice set is probably the original set that came with my Mentzer Red Box back in 1984. They’re worn badly but just look awesome. A close second would be my Chessex Borealis Smoke set. They’re gorgeous black with iridescent green shimmering metallic. 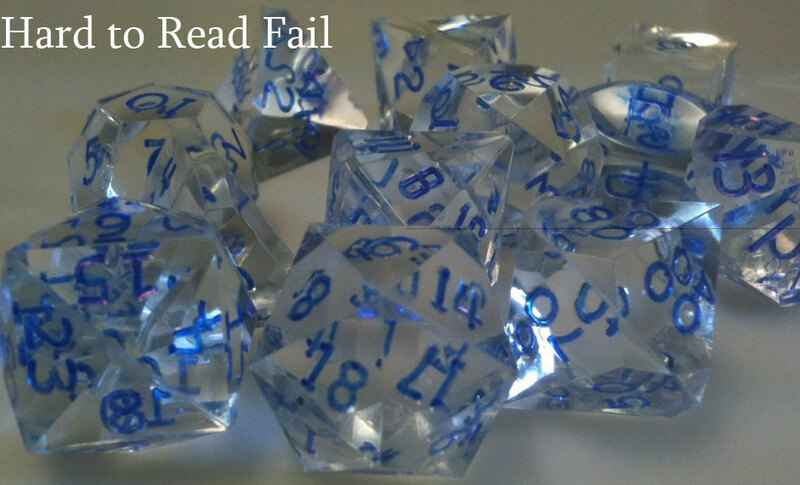 The d20 rolls way longer than you’d expect it too if you roll it right, making for very dramatic outcomes. 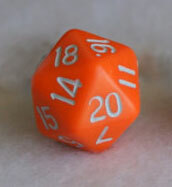 My favorite individual die is probably the orange Koplow (at top of article) d20 that was the D20 from the very first set of dice I purchased on my own (outside of a box set). Buying dice separately really made me feel like I was participating in the hobby and making it a more personal experience. It has been brought to my attention that this article overlooks a key die that has played an integral part of many, many games I’ve DM’d in the past 3-4 years. It is a die of great renown. When it leaves the pouch, players quiver in fear. It’s reputation is without blemish. It rolls smooth, feels good in the hand and rarely disappoints. 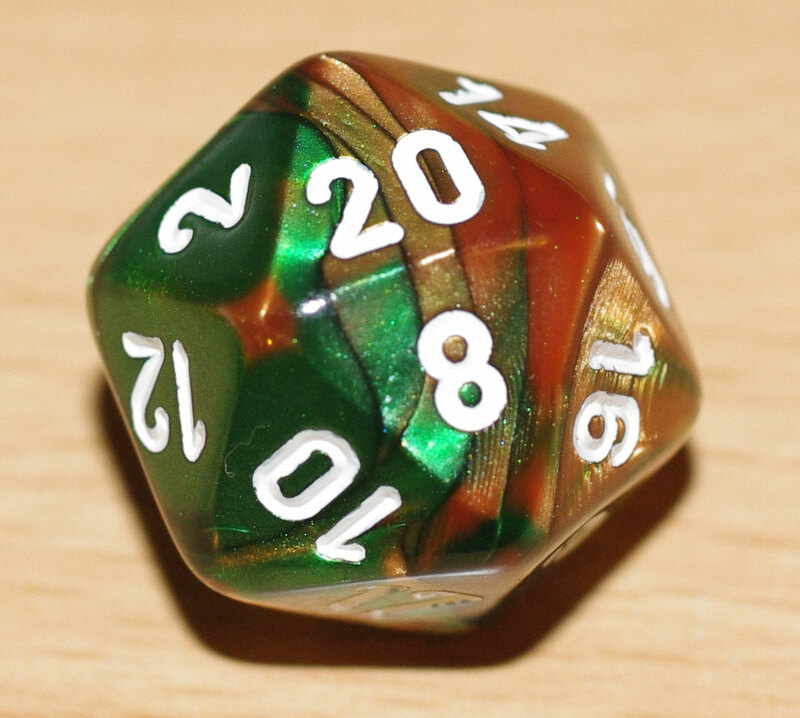 It had never gone a full night in play without rolling a 20 and the most common occurrence on its face is the glorious 18. It has been tested hundreds of times and has only felt cool to the touch one time in late 2011. This was all in the hands of a DM. It’s first full night run in the hands of a player, it rolled an amazing 5 critical hits. This is coming from the hands of a player who might go 3-5 sessions without a single critical to his name. And, so, without further ado, I present to you…. Seriously, you write an article on dice and don’t mention the the wrecking ball!?! You’re absolutely right. It just goes to show, it’s a die that is simply waiting to roll. It’s not loud or pretentious. It just brings the game. It doesn’t need accolades or attention, because it is supremely confident. The Wrecking Ball doesn’t need you or me or anyone. It simply needs a target.